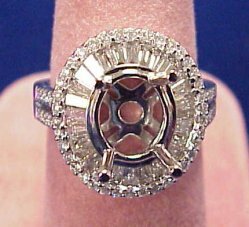 Round brilliant cut center diamond with channel set diamonds in lovely 14K gold! NEW ARRIVAL! 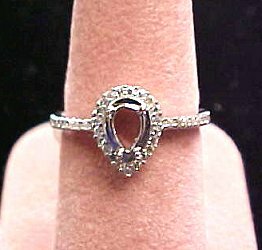 Pear shaped diamond semi mount. Just imagine a stunning ruby or emerald in this pave' diamond semi mount. This lovely piece contains 0.15 ctw round brilliant diamonds in 14k white gold. NEW ARRIVAL! 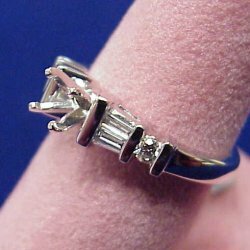 Princess shaped diamond semi mount. 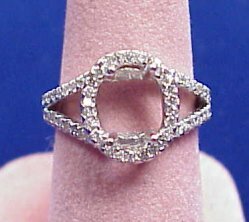 0.10 ctw pave' style diamond semi mount in 14k white gold. This piece would look terrific with any colored stone or a beautiful diamond. We have a great selection of loose stones available at wholesale prices. ALL NEW! Our LUCIA Platinum Mounting! Introducing our LUCIA! Lucia is constructed in solid platinum. Lucia is loved for her styling...the diamond is set to a low profile allowing those who work with gloves to finally have a beautiful ring that wont get in the way! NEW ARRIVAL! 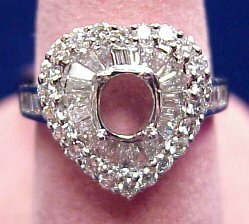 0.94CT TW Diamond Heart Semi-mount in 18KW gold. Fall in love all over again with this stunning diamond heart semi-mount ring. 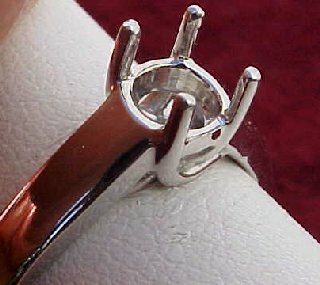 Make this ring your own with a diamond or colored stone of your choice. 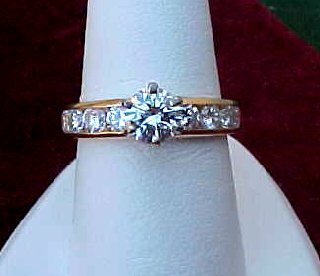 Set with 0.94CT TW of round and baguette cut diamonds, G-H Color, SI Clarity in 18KW gold. WOW! 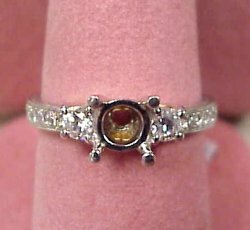 Just imagine a brilliant diamond or your favorite colored gemstone in this incredible diamond mounting. Consisting of 26 tapered baguettes and round diamonds of G-H Color, SI Clarity, beautifully set in 14KW gold. Now you can capture that vintage style with this new Pave' diamond semi-mount. 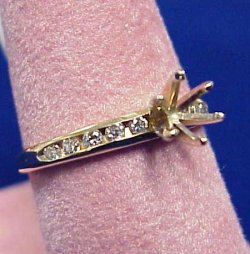 Consisting of 0.55CT TW round diamonds of G-H Color, SI Clarity and constructed of 14KW gold. DIAMONDSHERE new arrival. This hand engraved platinum and 18K semi-mount will stand alone. 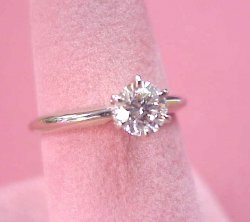 It is set with 0.44CT TW of round brilliant diamonds G Color, SI Clarity. The fine detail in this unique piece will be the envy of all of your friends. Check out our certified loose diamonds to complete this exquisite piece. 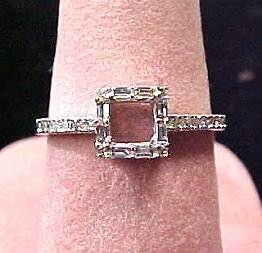 0.33CT TW of round and baguette cut diamonds of G Color, SI Clarity make up this platinum semi-mount. This is very well made ring. 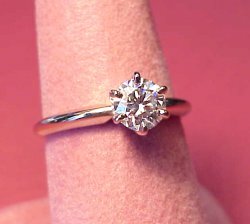 0.15CT TW makes up this perfect semi-mount for a half carat or larger diamond and we always have a large selection in stock.